LabVIEW™ has become one of the preeminent platforms for the development of data acquisition and data analysis programs. LabVIEW™: A Developer’s Guide to Real World Integration explains how to integrate LabVIEW into real-life applications. Written by experienced LabVIEW developers and engineers, the book describes how LabVIEW has been pivotal in solving real-world challenges. Each chapter is self-contained and demonstrates the power and simplicity of LabVIEW in various applications, from image processing to solar tracking systems. Many of the chapters explore how exciting new technologies can be implemented in LabVIEW to enable novel solutions to new or existing problems. 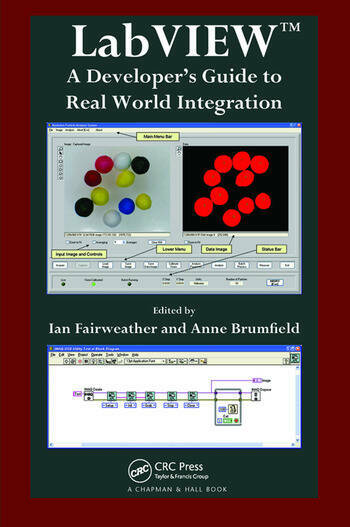 The text also presents novel tricks and tips for integrating LabVIEW with third-party hardware and software. Ideal for LabVIEW users who develop stand-alone applications, this down-to-earth guide shows how LabVIEW provides solutions to a variety of application problems. It includes projects and virtual instrumentation for most of the programs and utilities described. Many of the authors’ own software contributions are available on the accompanying CD-ROM. Ian Fairweather is an engineer in the School of Sport and Exercise Science at Victoria University. A member of the IEEE, he is also an associate researcher in the Institute for Sport, Exercise and Active Living and the secretary of the Health & Exercise Science Technologists Association. His research involves software and hardware developments in sports science and engineering. Anne Brumfield is an independent consultant in sports testing and medical device development. A member of IEEE and the IEEE Robotics and Automation Society, she has worked at the University of Pittsburgh and the U.S. National Institute for Occupational Safety and Health. Her research interests include sensor integration, wireless data acquisition, and signal and image processing.